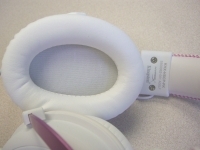 The next two images focus on the comfort features of the Cloud II headset. 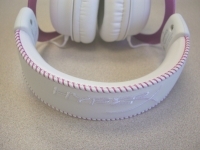 In the below left image we see the top of the headband, which has a good deal of padding under the leather-like skin. 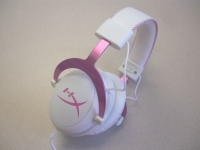 The look is also quite refined too, with the HyperX logo embroidered in the top, and baseball-like stitching in pink around the edges. It is definitely comfortable and good looking, and they feel like they should hold up to regular usage quite nicely. 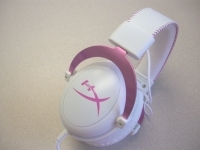 The earcups are also very comfortable, whether you use the leather-like finished set, or the cloth covered set. I prefer the leather-like ones, as they seem to stay cooler (and perhaps TMI, but I am less concerned with getting them sweat stained / oily). The final set of images in this section shows the range of adjust-ability available. A small child's head will fit in these, just as well as my pumpkin head. The adjustment is made with a sliding motion that locks in to a variety of positions with a click. The metal bracket gives them strength, which should lead to longer lif, and the weight is not adversely impacted. I feel you could where these for extended sessions without getting fatigued. Through the other sections of the review I have already covered some aspects of the Cloud II headset while in use. They are definitely comfortable and should suit a wide range of users just fine in that department. I wore them for quite a while over several days, and will give a quick summary of my impressions during some 3D games and while using them for multimedia enjoyment. I typically use a 5.1 channel set of surround sound speakers with my main desktop computer, and I appreciate the type of performance I get in games. Headphones with virtual surround sound definitely give more of a sense of immersion in a gaming environment than a 2 channel headset, but it is completely convincing. The Cloud II are definitely good at simulating 7.1 surround sound, better than some others I have tried, but they still leave me with the same impression that a set of true surround sound speakers can't be touched by a surround sound headset. If you have to game quietly, and your subwoofer's thumps just aren't a welcome presence late at night, the HyperX Clound II's will definitely let you game while enjoying the audio and video. While listening to music or watching movies, the Cloud II headset is impressive in part for the sound, but also because they do a good job to isolate you from outside noises. They are not noise cancelling, but the size and materials of construction do a good job to keep you immersed in what you are trying to enjoy, and not the outside world. I will not claim to be an audiophile, but the sound produced was very good to me. The tracks I listened to were reproduced as expected, without any hissing or pops that can sometimes creep in.